Cities the world over are highly fragmented. The fragmentation of the built-up area cities by the open spaces interpenetrating them is a key attribute of urban-sprawl, and sprawl as fragmentation, as distinct from sprawl as lower-density development, is now a universal feature of cities. Using satellite images and census data for 1990 and 2000 for a global sample of 120 cities, we find that cities typically contain or disturb vast quantities of open spaces, equal in area, on average, to their built-up areas. That said, we find that fragmentation, defined at various spatial scales as the relative share of open space in the urban footprint as a whole or in parts of it, is now in decline. We use multiple regression models to explain variations in fragmentation and in its decline among cities and regional groupings. 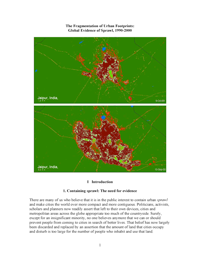 We find that larger cities are less fragmented; that high levels of car ownership tend to reduce fragmentation, possibly because they allow infill at relatively low costs; that there were parallel declines in average built-up area densities and in levels of fragmentation during the 1990s; and that cities that do not permit development in large areas around are slightly, yet significantly, less fragmented. Policies aimed at reducing fragmentation should be clearly distinguished from policies aimed at increasing the density of built-up areas. Encouraging infill in cities with little population growth is qualitatively different from encouraging infill in cities with rapidly growing populations. In the former, it can form the backbone of an effective ‘smart growth’ policy. In the latter, it is overshadowed by the urgent need to prepare vast areas for projected outward expansion.